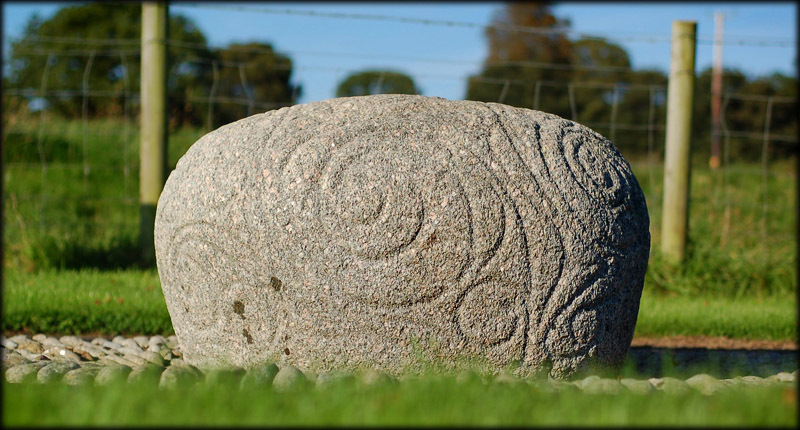 In the grounds of Castlestrange Demense lies this beautifully inscribed cult stone, decorated in curvilinear ornament and dating to around 200 BC. The design or ornament is done in the Celtic La Tene style. 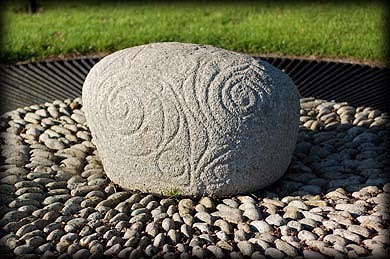 There are only a few decorated cult stones in Ireland, this stone and the Turoe Stone which is not too far from here in county Galway are amongst the finest examples in Europe. Where as the Turoe Stone design is done in relief this stone is incised. 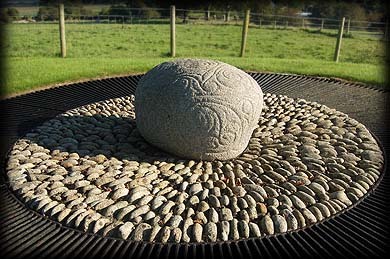 The stone measures almost 1 metre in length and over 1/2 metre in height. I had peviously visited this stone during the winter, on my latest visit the light was more favourable, the stone is situated in a field quiet close to the entrance to the demense and is positioned on some pebble stones with a cattle grid placed around it for protection. Situated: From Athleague in County Roscommon take the R362 west for Glenamaddy after 1/4 mile you will see a sign for Castlestrange cult stone take a right here and follow the road till you come to the entrance for Castlestrange it is well sign-posted. Discovery Map 40: M 8200 5964. Last visit Aug 2007.